A scenic picture taken of a beautiful sunset taking place over the Olympic Mountains in Washington State. 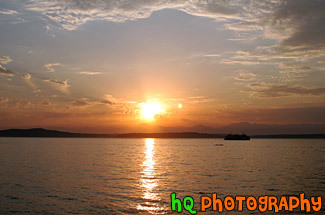 This photo was taken from across the city of Seattle at Alki Beach. In the photo you can see a ferry boat in the Puget Sound.